A list of West Virginia Candidates for Congress are listed below by congressional district. 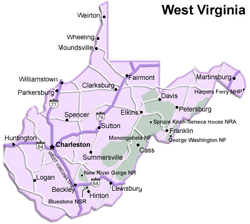 The climate of West Virginia is a humid subtropical climate in some of the lower elevations, primarily in the southwestern portion of the state, along with parts of the Eastern Panhandle east of the Appalachians with hot, humid summers and milder winters. The rest of the state generally has a humid continental climate with warm to hot, humid summers and cool to cold winters, increasing in severity with elevation. Some southern highland areas also have a mountain temperate climate where winter temperatures are more moderate and summer temperatures are somewhat cooler. However, the weather is subject in all parts of the state to change. The hardiness zones range from zone 5b in the central Appalachian mountains to zone 7a in the warmest parts of the lowest elevations. In the Eastern Panhandle and the Ohio River Valley, temperatures are warm enough to see and grow subtropical plants such as Southern magnolia, Crepe Myrtle, Albizia julibrissin, American Sweetgum and even the occasional needle palm and sabal minor. These plants do not thrive as well in other parts of the state. The Eastern prickly pear grows well in many portions of the state.